In the person of the great elder, Metropolitan Zenobius of Tetritskaroi (in schema, Seraphim) was wondrously combined the sanctity of his personal life, love for people, and love of enlightenment. 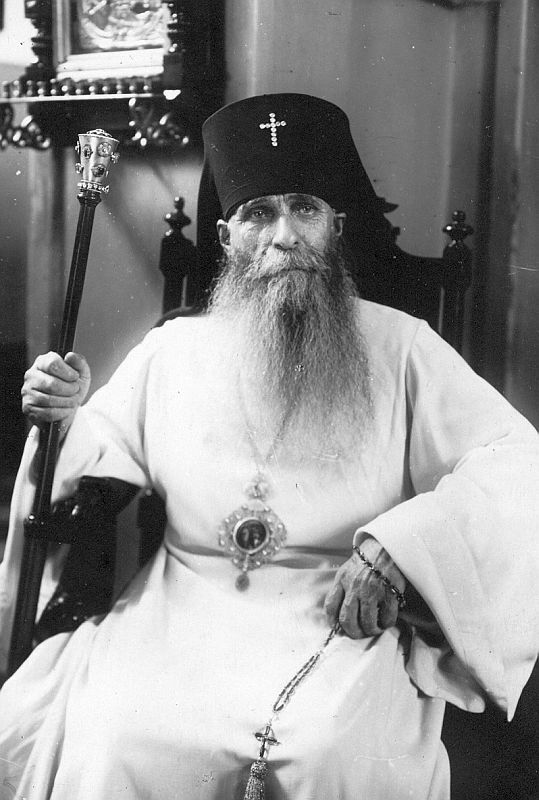 The future Metropolitan Seraphim (in the world, Zakharia Joachimovich Mazhuga) was born on September 14, 1896 in the town of Glukhov to a working class family. Having lost his father early in life, he was raised by his mother, and often went to Glinsk Hermitage. The grace-filled atmosphere of the monastery and the example of his God-loving mother instilled the love of God in him. In 1914, he became a novice of the monastery, and in 1916, Zakharia Mazhuga was called to military duty. In the swamps of Pinsk he developed eczema and thrombophlebitis. But the young man's worst fear was killing someone. It was resolved by a miracle: through his fervent prayers, he was sent to the ranks of armed escorts, and did not participate in the battles. After demobilization, Zakharia returned to the monastery, where he received the monastic tonsure with the name Zenobius. During the terrible period of civil war, Zinobius was entrusted with the dangerous obedience of gathering wheat from the monastery mill. While other monks who had this obedience where attacked, his loads of wheat were never robbed. In 1922, Glinsk Hermitage was closed. The young monk moved to the Caucasus, to the Drandsk Monastery of the Dormition near Sukhumi. Soon that monastery would also be closed; Fr. Zenobius moved with some other monks to the mountains of Abzhazia and started a small skete of desert dwellers. The monks had no peace there either. There was one miraculous incident when Fr. Zenobius climbed into a bear's lair to hide from the authorities, and the bear did not touch him. Fr. Zenobius moved to Rostov-on-the-Don, where he was arrested in 1930, and held for seven months without even receiving an accusation for his arrest. In imprisonment in the Urals, he performed the services and needs from memory. Everyone respected him for his generosity and fearlessness, and always called him "father." One day a miracle happened to him: he was returning to the camp in winter after work when he saw a bunch of grapes lying on the snow—something nearly impossible in January in the Urals. He gave a grape to each man in the brigade, and there was enough for everyone. Having been in prison for four years and eight months, Fr. Zenobius left for Tbilisi. Later he was the rector of a church in Armenia, and then served in Batumi. After the restoration of ecclesiastical relations between the Georgian and Russian Churches, Fr. Zenobius was appointed dean of all the Russian parishes in Georgia and Armenia. From 1950 until his very death he was the rector of the St. Alexander Nevsky Church in Tbilisi. Archimandrite Zenobius was consecrated a bishop in 1956, and in 1972 he was raised to the rank of metropolitan. All those around him treated him with great respect and gratefulness, amazed at the harmony in him of hierarchical magnificence with monastic humility. Having become an archpastor, Vladyka always maintained his connection with Glinsk Hermitage, providing shelter to many of its brothers after it was closed in 1961, among whom were elder Seraphim (Romanstov) and Andronik (Lukash). Vladyka departed to the Lord on March 8, 1985.